An oil painting by Adolf Hitler is to go on display for the first time at a museum in northern Italy. The small untitled work has been lent by a German private collector to the Museum of Salo, on the shores of Lake Garda, for an exhibition called the "Museum of Madness", Corriere della Sera reports. 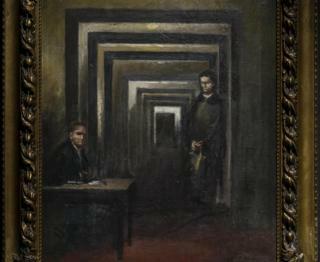 It shows two men, one at a table, with a dark corridor extending behind them. The exhibition's curator sees little artistic merit in the undated painting. "It's a piece of crap," says curator Vittorio Sgarbi. "It's a painting by a hopeless man, it could have been done by Kafka, it says a lot about his psyche: here you do not see greatness, you see misery." Hitler famously applied to the Vienna Academy of Fine Arts in the 1900s but was rejected twice. Despite being considered a mediocre artist, his work has fetched considerable sums at auction in recent years. Alongside Hitler's work will be pieces by world-renowned artists including Francisco Goya and Francis Bacon. The exhibition also has photographs, sculptures and multimedia installations, all exploring the theme of insanity through art history. The exhibition opens on Saturday and its setting is fitting, as Salo was the de facto capital of Benito Mussolini's Nazi-backed puppet state, the Republic of Salo, between 1943 and 1945.